Enhance visual inspections and improve Quality Control with this easy to use video inspection microscope. 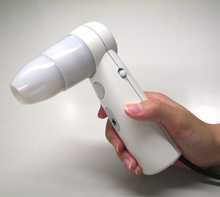 Touch any object or surface with this hand-held microscope camera, then watch the live color video image on the screen as you examine samples. Just by touching the sample with the internally lit lens tip, you are instantly focusing, illuminating, and magnifying to the screen. Capture still images to save, display on screen, or print using our optional video adaptor. The Scope On A Rope™ L2 is small and light and easy to move around, allowing visual inspection and quality control with this video microscope camera just about anywhere. The Scope On A Rope™ L2 is unique among our other products because it is the most affordable model with high quality output to a TV, LCD panel or projector. It provides the versatility you want with a wide variety of interchangeable lens options from 1x up to 400x (the lenses and accessories are also shared with the ProScope HR). By adding the optional video adaptor, you can also connect it to a computer to display video, and capture stills and videos allowing you to take the microscope visual inspection system with you on a laptop for portability and quick and easy quality control in the field.. An optional microscope adaptor provides video out for a traditional microscope.